Salon News USA is published bimonthly. 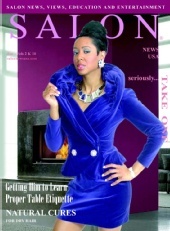 A publication that honors the essence of salon owners, licensed cosmetologist, nail technicians, barbers, estheticians, and other professionals in our industry as well as consumers in the areas of hair, fashion, style, society and the arts. We have a rare opportunity for the right intern to assist the publisher for hands on experience. This will not be your typical just answering telephones type of internship. This is an unpaid (but expenses covered) internship that could lead to pay for the right candidate. You will work directly with the publisher in all aspects learning the business. Weâre fortunate to work with some of the best talent this city has to offer in the way of hair stylists, makeup artists, clothing designers, etc. All work can be done from home via the Internet and email with proper computer skills and one on one meetings once a week. There will be some errands to run so transportation is needed.